Clockwise, left to right, Barbara Sutton, Capt. 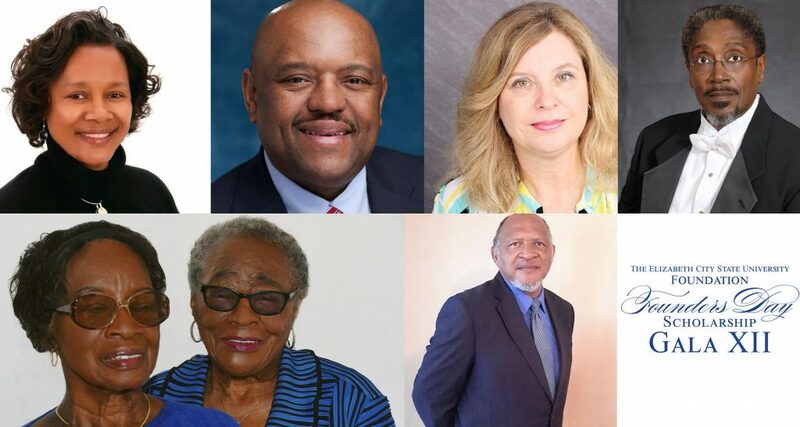 Anthony Swain, Norma James, Billy Hines, Justina and Joyce Long, and Johnny Walton, will receive the 2019 Chancellor’s Legacy Award at the 12th annual ECSU Foundation Scholarship Gala March 9. 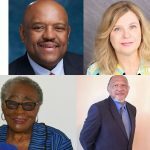 The 12thannual Elizabeth City State University Foundation Scholarship Gala is March 9, and seven men and women will be honored for their service with the Chancellor’s Legacy Award. Joyce and Justina Long, Billy Hines, Capt. (Ret) Anthony Swain, Norma James, and Johnny Walton will be honored at the event, held at the K.E. White Center. Sisters Joyce and Justina are 1954 ECSU graduates. Lifetime educators, the Longs have been public servants and significant supporters of their alma mater. Whenever ECSU calls, the Longs are ready to serve. The Longs have served on the boards or are members of the Museum of the Albemarle and the Arts of the Albemarle, NAACP, Golden K Kiwanis, the National Association of University Women, and numerous other groups. They are lifelong members of Cornerstone Missionary Baptist Church. They are co-founders of the ECSU Legacy Room. The Longs organized the sale of plaques recognizing the accomplishments of those in the ECSU community. All of the donations raised as a result of their work have benefited the university’s numerous scholarship programs. Both are life members of the ECSU National Alumni Association, Incorporated and proudly boast more than 23 graduates from their family. A 1982 ECSU graduate, Capt. Swain is a lifetime member of the ECSU National Alumni Association, Anthony Swain is a retired captain in the U.S. Navy with a long and distinguished career. He has served as president of Washington DC Metro Alumni Chapter for the last five years. His foremost goal is to help students in their quest to attend and complete college through financial and mentoring support. After graduation from ECSU, he worked for the Internal Revenue Service as an auditor, then the US Navy, retiring after a 30-year career. He received a Master of Science in Financial Management from Naval Postgraduate School and MS in Resource Strategy, Industrial College of the Armed Forces. Capt. Swain’s last active duty assignment was Naval Inspector General Washington DC as the Director of Inspections. He also served as the Maritime Operation Center Director for Commander Fleet Forces Command. He joined Northrop Grumman Corporation in November 2014 in Government Relations, and moved to Business Development, December 2016. He is currently the Navy account business manager for Northrop Grumman Corporation in the Mission Systems Sector. Ms. Sutton is a retired ECSU administrator. During her time at ECSU, she held several positions, including service as a Title III professional in the Office of Federal Programs, assistant to the assistant director of Development and Planning, accounting technician for the ECSU Foundation, interim director of alumni relations, assistant director of alumni relations, and staff senator. She retired as the director of alumni relations after 45 years of service to the university. During her career as a development professional, Ms. Sutton assisted the ECSU Foundation and University Advancement in raising over $10,000,000 in private money; increased alumni giving by 50 percent; established multiple planned gifts, and served as the liaison between the university and the ECSU National Alumni Association, Incorporated. Under her leadership, the Pre-Alumni Endowment was also established. She is a life member of the ECSU NAA and active member of the Elizabeth City Area Alumni Chapter. Recently, she was elected to serve on ECSU NAA Board of Directors. In 2009, professor of music and voice, singer and artist-in-residence, and the director of the ECSU University Choir, Billy Hines, retired after a 34-year career. The University Choir, acclaimed as an “incredible group of voices,”performed annually on tour and in appearances on campus and throughout the United States, Europe, and Africa. Prof.Hines holds a Bachelor of Arts degree in Music Education from Stillman College and Master of Arts and Master of Education degrees in music and music Education from Teacher’s College, Columbia University, and a Certificate in Managing the Arts from the University of North Carolina at Chapel Hill. A native of Alabama, Prof. Hines is an accomplished baritone soloist, a skilled adjudicator, clinician, and conductor. Norma M. James graduated from Elizabeth City State University in 1988 with a Bachelor of Science in Basic Business Education. She went on to get her real estate license in 1991 and received her broker license in 1994. James served as an ECSU Board of Trustee member from 2004 to 2015. She participated on several committee, including chair of the Buildings and Property and member of the Executive and Personnel committees. During her tenure, she also successfully orchestrated an increase in board giving to support general scholarships and student success activities. Johnny Walton graduated from Elizabeth City State University in 1969. He would go on to have a successful career in the NFL, and as an educator in his hometown of Elizabeth City. Mr. Walton would become the first African American quarterback in the NFL from North Carolina, playing for the Los Angeles Rams. He would go onto to become quarterback for the Philadelphia Eagles and play for the Continental Football League. Returning to Elizabeth City, Mr. Walton would be ECSU’s head football coach from 1980 to 1982. He would return to pro-football, playing in the World Football League and the USFL. In honor of his sports legacy, Mr. Walton was selected to ECSU’s Sports Hall of Fame in 1985 and was honored with the Legacy Award for the All Fish Bowl Team in 2012. He also received the Trey Whitfield Legacy Award in 2015. In 2017, he was selected to represent Elizabeth City State University and the CIAA as a “legend” in celebration of 125 years of Black College Football. In addition, he was honored to be selected by his peers as one of the finalists for the 2019 Black College Hall ofFame. Mr. Walton currently serves as a member of the Elizabeth City Town Council.